Public transportation is highly recommended on football game days. 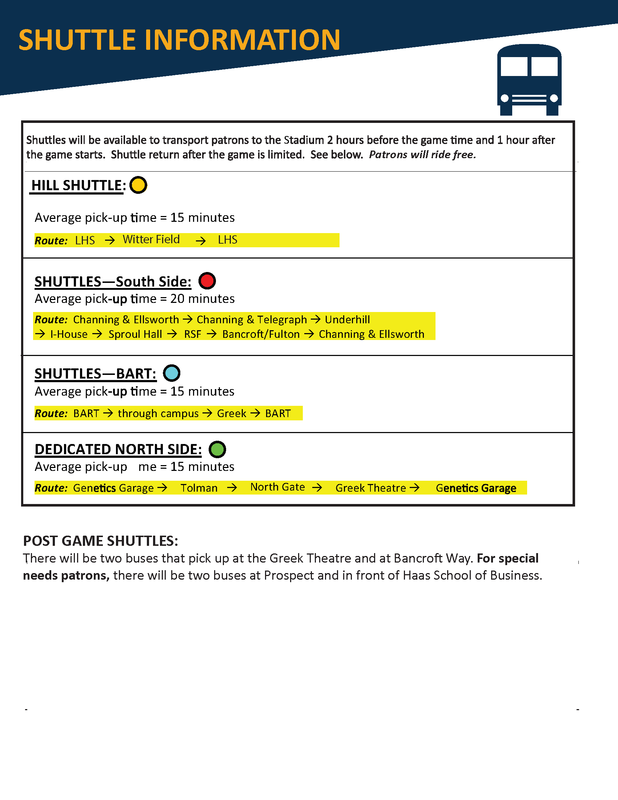 Game day shuttles offer transportation to Memorial Stadium from the Downtown Berkeley BART station and nearby campus locations. For help with trip planning or real-time traffic information visit 511.org or call 511. For information on the game schedule, visit the Cal Bears Athletics site. 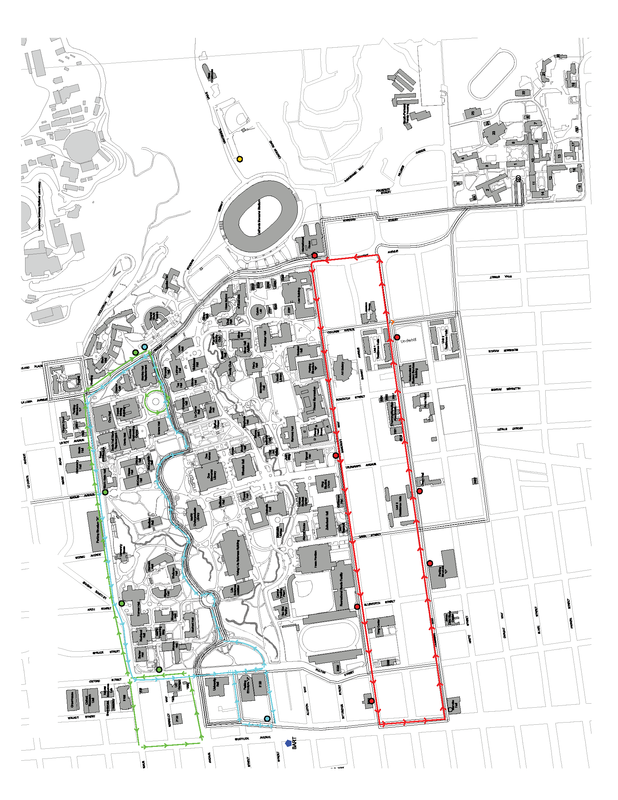 Shuttles will provide access between the North and South Sides of campus, the BART station, the Hill, and Memorial Stadium. Service will begin two hours before the game to one hour after kickoff. Free service for all, however, return service from the game will be limited. During football games there are a limited number of parking spaces available to annual permit holders. Please note that Daily Scratch-off tags are NOT valid on game days. On game days most campus parking areas are made available only to Football permit holders. Vehicles not displaying a football permit are subject to citation and towing. To purchase a Football parking permit, contact the athletics department at 1-800-GO-BEARS (1-800-462-3277). Start at Hearst Avenue and Oxford Street. Head east on Hearst Avenue toward Euclid Avenue. Stay on Euclid Avenue for approximately 1.5 miles until you reach Marin Avenue. Turn right onto Marin Avenue. Turn right at the top of the hill onto Grizzly Peak Boulevard. Travel for approximately 1 mile, then turn right onto Centennial Drive. Parking is available at the Lawrence Hall of Science Parking Lot and at other posted lots along Centennial Drive. See our parking map for parking lot locations. There is no RV parking on campus. Clark Kerr Campus Northwest Lot and Clark Kerr Campus Southwest Lot are closed to RH permit holders during home football games. All Clark Kerr Campus Residence Hall permit holders are required to relocate their vehicles to Underhill Garage (entrance on Channing Way between Bowditch Street and College Avenue) by 9:00 pm the day before a home football game. Vehicles not moved from the CKC Northwest and CKC Southwest Lots by 9:00 pm the night before a home football game will be subject to citation and/or towing at the owner's expense. Vehicles can be returned to the CKC Northwest and Southwest Lots after the game ends. Additionally: Berkeley High School at 2000 Bancroft Way (@Milvia), with entrances on both Durant Avenue and Bancroft Way. Cost for Parking is varies per event. Patrons may tailgate in this lot as long as they clean up after themselves. Transit will also be provided post-game. There will be two buses that pick up at the Greek Theatre and at Bancroft Way. For special needs patrons, there will be two buses at Prospect and at Haas. Go to the disability parking page for more information on UC Berkeley disabled parking policy. 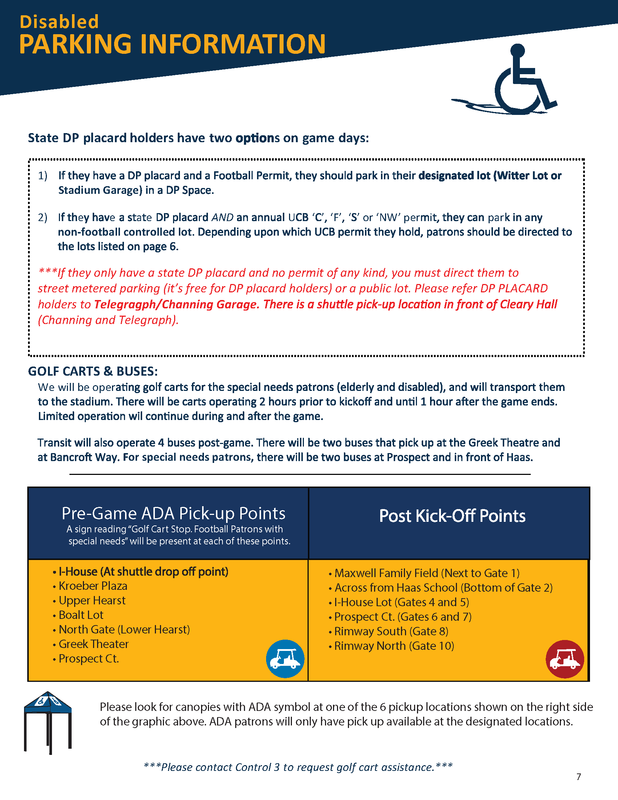 For disabled drivers who are Football permit holders, the Athletics Department has provided disabled spaces in the Stadium Garage and at Witter Lot. Charter buses may park at Eucalyptus Grove, near the West Gate Kiosk. The onsite attendant can assist and buses can reach this location via University Avenue and Oxford Street, east of Center Street. The parking fee is $50. We accept cash only. Please use bills no larger than $20. For more information, contact Parking and Transportation at (510) 642-5401.